Submitted by Christopher Duggan Photography. Originally published on June 22nd, 2016. A word from the photographer: Charlotte & Scott’s Seranak wedding at Tanglewood in the Berkshires was absolutely gorgeous with a magnificent view. They had their ceremony outside during a stunning sunset, so we were able to photograph them with an incredible backdrop. There were flowers everywhere. It was beautiful. Charlotte’s bouquet and all the floral design was created by Carolyn Valenti Flowers. 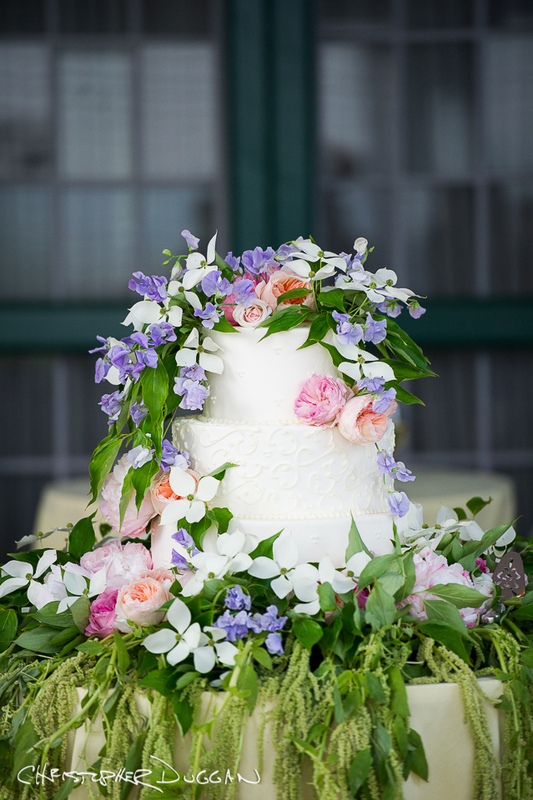 Charlotte & Scott had floral arrangements throughout the venue and on the cake. Every now and then you see a cake with flowers, but this one really stood out to my team, because it was bright and eye-catching and abundant. The bride’s nieces were three of four flower girls, and they were all adorable. The band that played during the reception was called The Sweetbeats. They were great, and their music had everyone dancing all evening. It’s always fun to see everyone on the dance floor having the time of their lives. During the reception, Charlotte & Scott’s friends and family said such wonderful things about them in their toasts. A lot of them mentioned how the couple really enjoys the same activities and spending time together hiking, biking, rock climbing and running. As always, I am very grateful to have been a part of Charlotte & Scott’s wedding day. Congratulations! !